NZ Family Planning, an affiliate of Planned Parenthood International have recently gained a licence from New Zealand’s Abortion Supervisory Committee to open a clinic to perform chemical RU 486 abortions in Tauranga. Family Planning had plans to open 30 new clinics, aka, ‘killing centres’ but withdrew all but the Tauranga application after Pro-Life groups around the country made their plans known to the public. The following article is from the Townhall.com website which features information concerning 42 botched chemical RU 486 abortions in the state of Ohio alone. That an official body of the NZ government seems to think it is acceptable to grant a licence to allow for new ways to kill future generations of our unborn children is reprehensible. What sort of health system are we now tolerating that is finding new ways to kill our precious unborn children, whose only ‘crime’ is that they are wanted? What level of selfishness does this show within our sick society when we have those who are prepared to kill other humans in order to live as they wish? Thousands of infertile couples are desperate to adopt new born children but we still have nearly 16,000 abortions per year yet only around 14 adoptions per year outside of the family. So instead of promoting adoption as a win win answer to the problem of abortion, New Zealand has instead decided it is a good idea to promote more killing. And we wonder why we have a problem with child violence. Read on for the article on botched medical (chemical) abortions in Ohio. 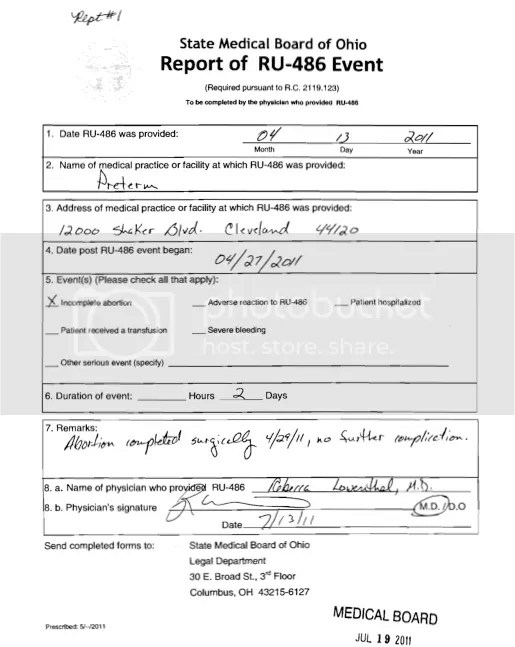 New reports obtained by Ohio Right to Life reveal Planned Parenthood’s neglect over the past few years of its patients and state protocol regarding the widely-used abortion pill RU-486. After sending young women home with the chemical abortifacient, many patients returned to clinics with complications such as “moderate to severe bleeding” and “infection.” What’s more, a total of 35 cases were reported as “incomplete abortions” — a situation which can cause birth defects for the child if the mother continues with the pregnancy. Perhaps most disturbing, however, was Report #7, which reads the patient never followed up with her clinic after they sent her home with the drug. This leaves Ohio Right to Life and other pro-lifers to wonder, what happened to that unborn child? Report #11 – Dr. Sarah Smith reported her patient suffered hematometra, an accumulation of blood in the uterus, according to wisegeek.com. RU-486 has killed fourteen women and injured more than 2,000 women in the US. These statistics, along with the new reports from Ohio, paint quite a different reality from the positive way the pill is portrayed on Planned Parenthood’s website — "Safe and effective."